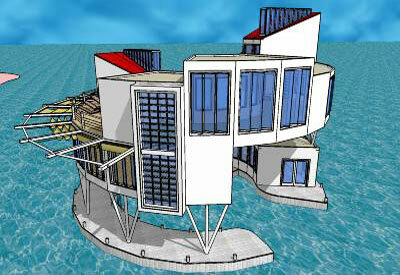 Description: This is an original design of a floating home for the Sketchup 3D Challenge 034. The windows are designed to channel air through each cressent shaped floor. The Roman shades on the second floor block unwanted sunlight. Each floor is about 1000 square feet for atotal of 3000 square feet of indoor living space. It includes a "lagoon" area on the first floor. In the future I may finish the interior with furniture components.